Gently heat the sugar and water to dissolve the sugar, then bring to the boil .boil steadily for 10 minute then leave until cold. Sieve or liquidize the strawberries to give approximately 300 ml / 1 1/4 cup puree. Mix the syrup and strawberry puree together. Pour into polythene container, cover and freeze until slushy –about 3-4 hours. Whisk the egg white until stiff, mash down the fruit ice and fold in the egg white until evenly mixed. Freeze again until semi-solid-about 1 hour. Remove from the freezer. To serve: place in the refrigerator for 30 minutes to soften slightly. 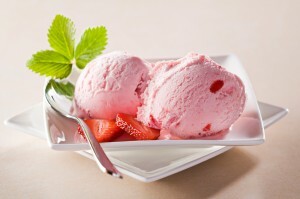 Spoon into dishes, decorate with few whole strawberries and serve with fan wafers. Note; other fruit purees may be used in place of the strawberry puree.